The original Proraso shaving classic, this refreshing and toning Shaving Soap is formulated for any beard on any man. This creamy soap produces a thick, elastic lather and is enriched with natural ingredients that make it particularly concentrated and rich. Made with a special "hot soap" process, it's left to mature in small batches for 3 days, producing an extremely thick and creamy soap that products a soft, rich lather. Eucalyptus Oil tones and purifies your facial hair and skin, Menthol helps refresh and revitalize, and Glycerin helps the blade glide smoothly and reduce razor burn and rashes. Cruelty-free, with 91% of ingredients of natural origins, and of course, there's no parabens, phthalates, silicones, mineral oils, artificial colors or sodium laurel sulfate. 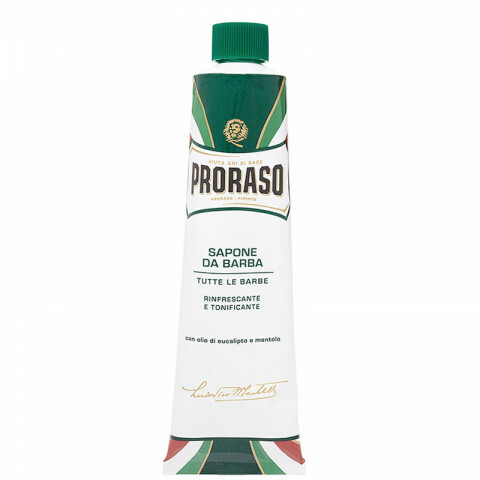 Originating in Italy, Proraso has been innovating professional highest-quality products in the shaving world for generations, and has evolved to become a staple of Italian culture. From the first product -- Pre-Shave Cream -- in 1948, to now, the Martelli family principles hold true: to create professional, quality products that deliver a pleasurable and impeccable shave, in the barbershop and at home. Creates a rich, thick lather for a close and comfortable shave without nicks or razor burn. Use a dime-size amount of shave cream to a brush or hands, add water to work up a rich lather. Apply to damp skin.